There is a way to send an election-wide reminder to all your voters, as well as a way to send an individual reminder to a single voter. 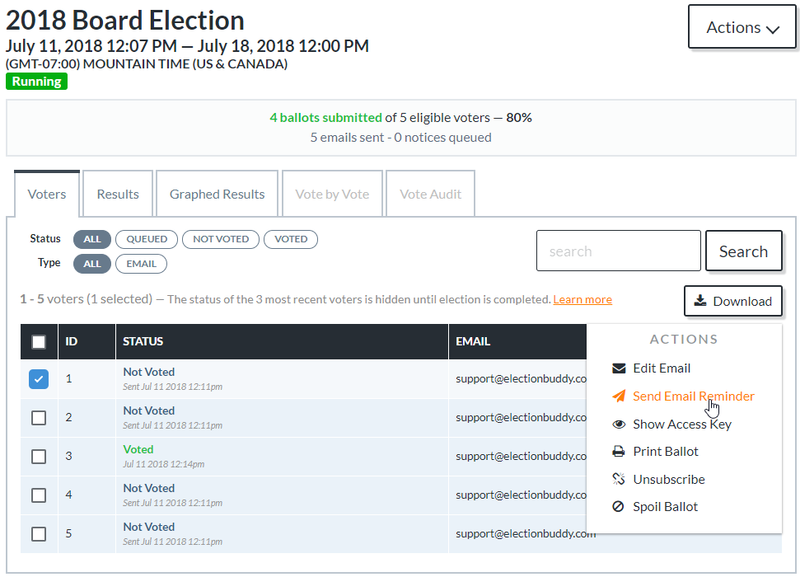 For instructions on how to send an email reminder to your entire voter list, please see " Sending an email reminder to your complete voter list". In your live (running) election, go to your "Voter List and Status" page. A window will open, allowing you to edit the reminder. Click "Send" to send the reminder. Not seeing the option to send a reminder? Your election may not qualify for reminders based on the price you paid for your election. Please see our pricing page for more details. Editing Your Election when the Election is "Ready to Run", or is "Running"